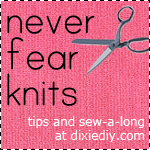 This post is all about stashbusting. I had made some curtains out of a light weight quilting cotton for an apartment I lived in, like, four years ago, and since then they’ve been sitting unused in my stash since they no longer had windows to cover. When I Like That Lamp offered me a lampshade kit to try out I knew I wanted to use this old pink floral on lime green fabric. I used the large size kit which is 12″ in diameter and 12″ high but you can make your shade shorter if you want. First of all I want to apologize. I took several in progress photos of the lampshade making progress but a few days ago my phone broke and I lost all the pics I had taken (moral of the story – back up your pics and don’t buy a Samsung GS4!). Luckily if you get a lampshade kit it comes with an instruction sheet that’s easy to follow. The kit comes with two metal rings for the top and bottom of the shade, adhesive styrene (a white flexible plastic that sticks to your fabric), some glue (which is plenty for this project), a pointy stick to help set the fabric edges, a handful of binder clips (which are nice ’cause you can re-use them on sewing projects that you can’t use pins on, like leather, see, I’m thinking ahead…). It was super simple to assemble – cut your fabric to size and stick the styrene on a few inches at a time. I didn’t have any trouble getting my fabric flat and it was easy to smooth any bubbles. Then using the glue you slip in the top ring and fold the extra fabric over the edge, encasing the ring. This took the longest time because I would wait for sections to dry enough to remove the binder clips. You do the same for the bottom ring. One thing I did was use some of my extra fabric and created 1″ wide bias tape (which was actually on the straight grain, it doesn’t matter because the tape won’t be under any stress) using my bias tape maker. With the raw edges folded in the tape is only 1/2″ wide. I had so much extra glue that it was easy to attach the tape to the top and bottom edges which covered up the raw fabric edge that was tucked under the back and created a nice clean line at the top and bottom. Plus, when I’m sitting down I can look up at the lamp shade and see the bias tape on the inside looking all nice and professional. It’s a great touch that makes it look less homemade. After I made my shade I loved it so much I decided to cut some more of my old curtain panels and sew new shorter panels for my sewing room window. The lime makes a good accent color to all the pink and coral in my sewing room. I just got a simple tension rod to avoid having to get out the screwdrivers. 😉 If I ever have a kid I really hope it’s a girl ’cause I really don’t want to re-paint this room and make new curtains, lol. I still have about a panel and a half left of curtain fabric – quilt pieces or throw pillows anyone!? Big thanks to I Like That Lamp for making me like my lamp! ***BTW, I like that Lamp is offering 10% DIY Lampshade Kits at their shop from now until the end of September. Use the code DIXIE13 at checkout. So Many Japanese Pattern Books!